Throughout the design phases, Divine Homes encourages a close collaboration between client and designer. The result is a custom designed home or addition that suits your lifestyle, tastes and personal requirements. The five phases described here are very general guidelines and are adjusted to each individual project. During the initial design phase, the client's overall space or design requirements are thoroughly investigated. A site visit and a discussion about general design ideas and wishes are vital to gain a clear idea of the task at hand. Very often magazine clippings from the client help define and visual the clients ideas. The industry calls this a "style file". Now it is time to reflect the proposed interior plans to the exterior elevations (i.e. design of front elevation). Emphasis is put on the roof lines, type of entry, garage elevation, location of the driveway, rear deck/patio, and rear walk out design. In the case of an addition the relation between new and old is resolved. Exterior material choices are crucial at this point (i.e. exterior material choice is closely related to structural construction method and overall budget). The interior design of the home or addition is now at a stage where individual areas such as kitchen, entry area and bathrooms are finalized. Elevations or free hand 3-D sketches of important interior areas are drawn up and reviewed with the client. At this point the design-development stage is complete. All approved floor plans & elevations that have been client-approved are revised and the final drawing package is produced. 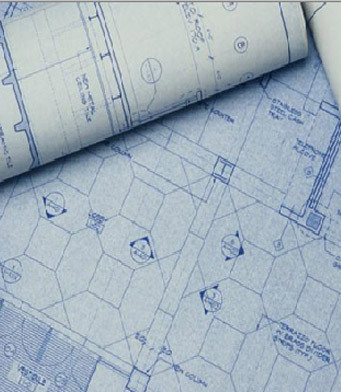 Structural plans are coordinated with the heating, engineering and plumbing layout. At the end of phase five, a complete set of drawings are produced, and the building permit is acquired.